Villa Oasis is a luxurious six-bedroom resort property situated on the stunning Andalusian coast of southern Spain, offering beautiful accommodation and exceptional views of the mountains and Mediterranean Sea. Completed in 2014, Villa Oasis fuses classic Spanish architecture with contemporary interior design, boasting three floors of elegantly furnished bedrooms and living spaces, indoor and outdoor dining facilities, a resort-style gym and spa, as well as a serene garden with salt-water infinity-edge pool. Located at the heart of the exclusive Sotogrande estate, an area of natural beauty and tranquillity, Villa Oasis is in close proximity to outstanding sporting facilities, such as the world class Valderrama and San Roque golf courses and the Santa Maria Polo Club, as well as the picturesque Sotogrande Marina. Receiving over 320 days of sunshine every year, and set amongst secluded grounds, fragrant with Pistacia Lentiscus, Jasmine and centuries-old Olive & Cypress trees, Villa Oasis offers the perfect retreat. Drift into peaceful slumber in one of Villa Oasis’s six spacious and luxurious double suites. Each accommodates an en-suite marble bathroom with walk-in rainfall shower, as well as a variety of amenities including built-in HD TV and sound system with on-demand TV and movies. In addition to the secluded courtyards and private gardens throughout the property, the spacious and comfortable lounge offers a serene space to sit back and relax to the gentle sounds of the grand piano. Or otherwise retreat to the comfortable sitting room, where a 70” HD TV offers on-demand TV and movies. Relax on the shaded seating and sun loungers of the covered terrace, with views of the villa’s secluded mature garden. A large lawn, framed by rows of centuries-old cypress and olive trees, leads to a 17m infinity edge salt-water swimming pool and discreet garden shower. Enjoy a healthy start to the day with breakfast served on the rustic wooden table in the kitchen, later graduating to the elegant ten-person dining room – a perfect spot for evening entertaining. Alternatively, enjoy an al fresco dining experience on the covered terrace, or perhaps a barbecue prepared in the garden pavilion. Enjoy a light meal prepared in the premium Gaggenau-fitted kitchen, featuring a Teppanyaki grill, dual wine fridges, ice maker, and fully-automated fresh coffee machine. Plentiful cooking utensils, crockery and cutlery are supplied, and a personal chef can be provided upon request. Looking out over the mountains and Mediterranean Sea, the day beds and sofas on the upper level sun terrace offer sun worshippers a perfect space to tan. Once the sun has set, the terrace becomes an elegant stargazing platform featuring a spacious six-person hot tub. Access to the open-air sun terrace is available from the Sotogrande Master Suite, and Córdoba and Seville Suites. Located on the lower level, a soundproofed ten-person private cinema boasts a massive 4.3m cinema screen and state-of-the-art Sony 4K widescreen projector with 7.2 Steinway digital surround sound system. Relax at any time of day on the luxurious reclining leather seats, and choose from over 300 recent release and classic HD movie titles from the on-demand digital library. Or make use of the Blu-Ray player, Sky TV, Apple TV, or Sony PS3 and Nintendo Wii games consoles. A fully-stocked and temperature-controlled wine cellar is also located on the lower level. Here you can choose from a wide selection of red, white and rose wines and champagnes from premium vineyards across Spain, Europe, and around the world. Each bottle is individually priced, and personal wine tasting evenings can be arranged on request. Villa Oasis offers six spacious and elegantly furnished double suites, each accommodating an en-suite marble bathroom with walk-in rainfall shower, as well as a variety of amenities, including a personal safe, bathrobes, and built-in HD TV and sound system with on-demand movies. Located on the upper level, the Sotogrande Master Suite offers an expansive 87 square meters of living space, featuring a 200x200cm Super-King bed, a private lounge area, a walk-in dressing room with table, and an en-suite marble bathroom with a large bath and walk-in rainfall shower. The suite’s large double doors open onto the shared sun terrace, where day beds and a spacious hot tub look out onto stunning views of the mountains and Mediterranean Sea. Situated on the upper level, the Córdoba Deluxe Suite offers a generous 39 square meters of living space, featuring a 180x200cm Super-King bed and an en-suite marble bathroom with bath, walk-in rainfall shower and garden. This suite offers a private balcony overlooking the serene entrance courtyard, as well as doors opening onto the shared open-air sun terrace. Located on the upper level, the Seville Deluxe Suite provides a generous 39 square meters of living space, featuring a 180x200cm Super-King bed and an en-suite marble bathroom with bath, walk-in rainfall shower and garden. The suite’s doors open onto the shared open-air sun terrace, offering stunning views of the mountains and Mediterranean Sea. Located on the ground level, the San Roque Suite provides a sizeable 33 square meters of living space, featuring a 180x200cm Super-King bed and an en-suite marble bathroom with walk-in rainfall shower. Two additional pull out beds are available for children. Situated on the ground level, the Granada Suite offers a spacious 30 square meters of living space, featuring a 150 x 200cm four poster King bed and an en-suite marble bathroom with walk-in rainfall shower. Located on the lower level, the Malaga Suite offers a spacious 30 square meters of living space, featuring a 180 x 200cm Super-King bed and an en-suite marble bathroom with walk-in rainfall shower. 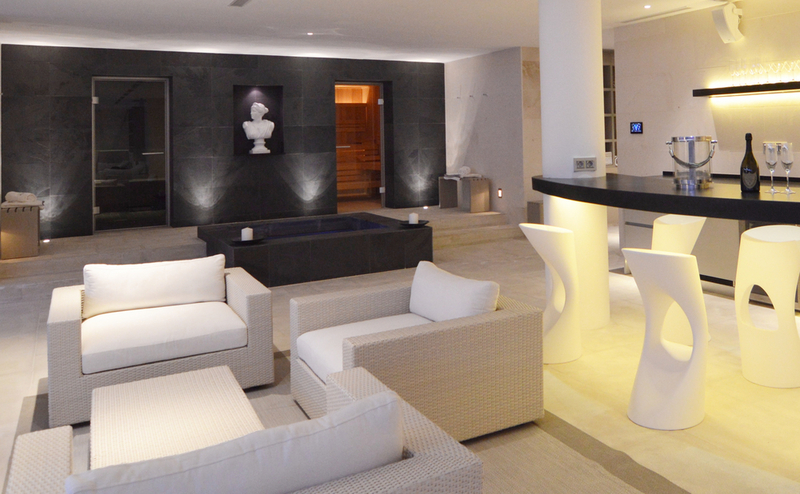 The Malaga suite opens out to a private terrace with water feature. Comprising much of the lower level of the property, perhaps Villa Oasis’s most defining feature is its spectacular spa and gym complex, offering a luxurious indoor pool, spa and fully-equipped gym. Pamper yourself at the Villa Oasis spa, an indoor haven featuring a heated swimming pool and whirlpool, Turkish bath, Finnish sauna, and spa bar offering a range of calming herbal teas. Set amongst serene mood lighting, soothing music and a spectacular starlight ceiling, the spa is designed to promote relaxation and overall wellbeing. Bathe in the heated 13m indoor fresh water pool, or activate the pool’s submerged jets for a steady swim against a perpetual current, before relaxing in the heated whirlpool with hydro-massage jets. A eucalyptus-infused Turkish bath and adjacent Finnish sauna provide the perfect combination of wet and dry heat to reduce muscle tension, improve circulation and cleanse the skin, before cooling off in the deep cold water plunge pool. Personal massage can be arranged on request. The oak floor and mirrored walls of this expansive gym house a range of professional grade Life Fitness™ cardiovascular and strength training equipment, offering a comprehensive and diverse workout irrespective of fitness level or experience. Sessions with a personal trainer can be arranged on request.